Happy Monday! Well this last week has been pretty awesome! It was Freddy’s 4th and my 31st birthday on Friday (check out my awesome birthday giveaway here where you can win over £700 of prizes!) I saw my lovely chum Laura on my birthday morning for cake and fun and spent the afternoon playing with Fred and putting together his new Lego. He’s obsessed with Lego at the moment! He had a birthday party on Saturday at the local soft play centre which was just crazy, there were zillions of kids running around, and he had the best time! I then went out with my friends on Saturday night for tapas in Norwich and a few cocktails, and spent yesterday recovering! At this point I have a confession. This post was supposed to be published yesterday, and for the last nine weeks I’ve been rather pleased with myself for sticking to my regular Sunday posting schedule but yesterday I basically layed on the sofa and binge watched OITNB. This is Orange is the New Black in case you’re not down with the lingo. The latest series was released on Netflix on Friday and I promised myself I’d pace myself and only watch one of two episodes a day, but I completely binged yesterday and I’m now up to episode 9 – oops! 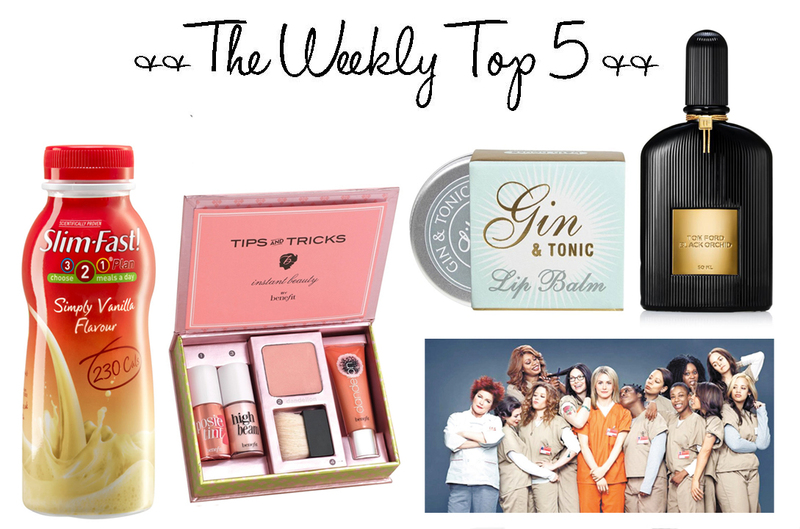 So anyway, here are the things I’ve been loving last week! Slim Fast Milkshakes (£1.60) – I started the Slim Fast 3.2.1 diet last week and I’m pretty impressed with myself so far for sticking to it – apart from my birthday treats but that doesn’t count right!? It definitely helps that I love their products, and the Vanilla and Strawberry shakes are definitely my favourites out of their range. I’ve been having these as meal replacements throughout the week and I really recommend them just because they’re so tasty! Tom Ford Black Orchid EDP (from £43.99 for 30ml) – This is one of my favourite ever perfumes but it’s kind of been unloved and pushed to the back of the shelf in favour of lighter more summery fragrances lately. I brought it out again last week and reminded myself how much I love it, this scent also brings back some great memories for me! Unfortunately I’ve just ran out too, so I’ll need to purchase a new bottle very soon! Benefit Feelin’ Dandy Set (£25.50) – Fred bought me this for my birthday (clever boy!) I haven’t had any new makeup from Benefit for such a long time so I’m really excited to try this set out. It contains four mini products including High Beam which is one of my favourite ever highlighters. Gin & Tonic Lip Balm (£5.50) – My stupid lips have been really dry – again. I’ve been applying this G&T balm on a daily basis and found it to be excellent at moisturising my lips. It doesn’t smell that much like G&T though unfortunately but it’s definitely a great little lip balm that does the job! Previous Post My Big Birthday Giveaway 2015! Wow very cool, great post. i love vanilla! Gin and tonic lip balm?! Yum!! I love the look of that…although I wish it DID smell of G&T!